I needed a Halloween costume and couldn’t think of anything to be. At work my nickname is barbie and so like two days before the party i saw this big box at work and they let me take it home i knew exactly what i was going to do with it. 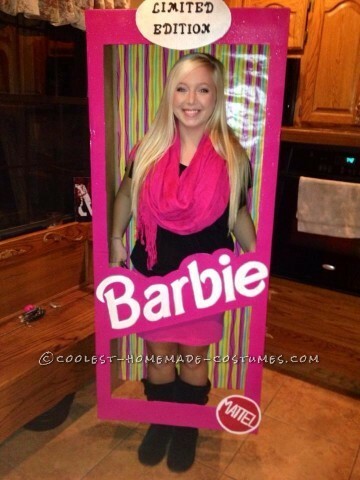 I was going to make a barbie costume! I went home that night and worked all night on drawing out everything and cutting the box and painting with lots of pink paint. I had paint everywhere! I used wrapping paper to put inside the box to give it an extra touch. Oh and don’t forget the glitter i hate glitter but i had to have some all over the word barbie. I kept my outfit simple because i wanted to the box to be the center of attention and it definitely was! I went to the party with this big box and everyone absolutely loved it. I have always been so creative and made my costume every year. This year though was the best one yet! I don’t think i could top it. Everyone wanted to try on the box and we took tons of pics. One person was a pirate so of course there was pirate barbie and dead barbie and lumberjack barbie and birthday barbie haha! by the end of the party everyone had taken there picture in the barbie box. But that is pretty much it on my barbie costume. Hope you like it!